Fujifilm has been hard at work the past two years in fleshing out their new X-series mirrorless system. While the current system only consists of eight Fujinon lenses and two Zeiss lenses, Fuji has done a great job at building a complete system very quickly. One of the latest additions is the company’s second zoom lens, the Fujinon XF 55-200mm f/3.5-4.8 R LM OIS. The Fuji 55-200mm covers a field of view equivalent to an 83-300mm zoom lens on full frame. It’s about a half stop faster than the typical telephoto zoom, which usually tops out at f/5.6. Fuji has priced the lens somewhat reasonably at $699. 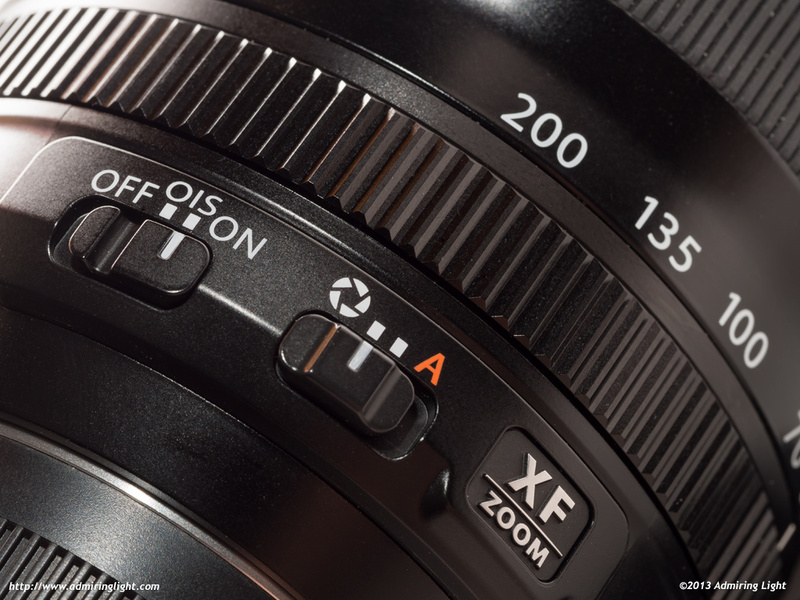 Let’s take a look at how this lens performs and what value it brings to the Fuji X System. If you haven’t read my reviews before, I do not generally perform resolution tests or make charts to track quality measures. I take a real world approach to my reviews and evaluate how a lens or camera handles and works in regular use. 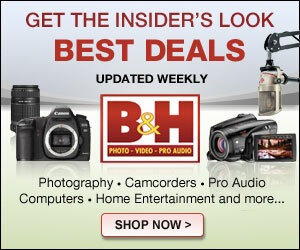 A special thanks goes to LensRentals.com for providing the review sample used for this review. The first thing that struck me about the 55-200mm when I took it out of the box was just how big it was. Now, first remember that I’ve been shooting with mirrorless cameras full-time for over two years now. For a mirrorless system lens, this thing is big. Very big. Now, to be fair: compared to an SLR telephoto, it’s pretty small, but this isn’t an SLR telephoto. Look at the image to the right, and you’ll see that it simply dwarfs the only other current Fuji lens in the telephoto range, the 60mm f/2.4 Macro. On the bright side, the lens is extremely well built. The lens is constructed of very high-grade plastics and metal. The zoom ring is heavy walled plastic with a comfortable rubber grip, while the focus ring and front element ring with hood bayonet are metal. The extending lens tube is also plastic. Despite having more plastic than most of the other Fuji lenses, there is no downgrade in build feel. The lens is extremely solid, with very tight tolerances and no wobbles. The focus ring is nicely damped and feels great, while the zoom ring is relatively stiff. I found the zoom ring to be a little too stiff for my tastes, but you won’t need to worry about zoom creep with this lens. The aperture ring sits below the zoom ring, and like the aperture ring on the 18-55mm f/2.8-4, the ring is continually spinning with no markings. 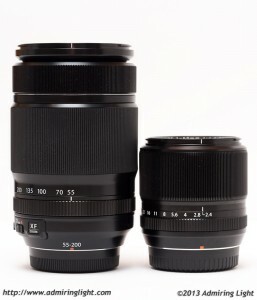 The Fuji 55-200mm uses a standard extension type zoom mechanism, growing longer as the focal length increases. WIth the hood mounted and the lens set to 200mm, the lens is quite large indeed. 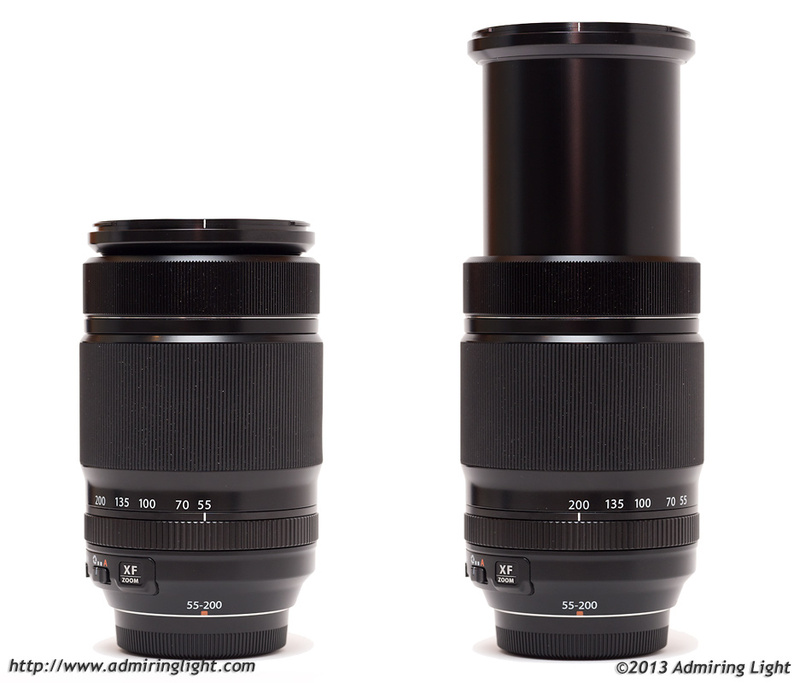 See the image below to compare the lens length at 55mm and 200mm. 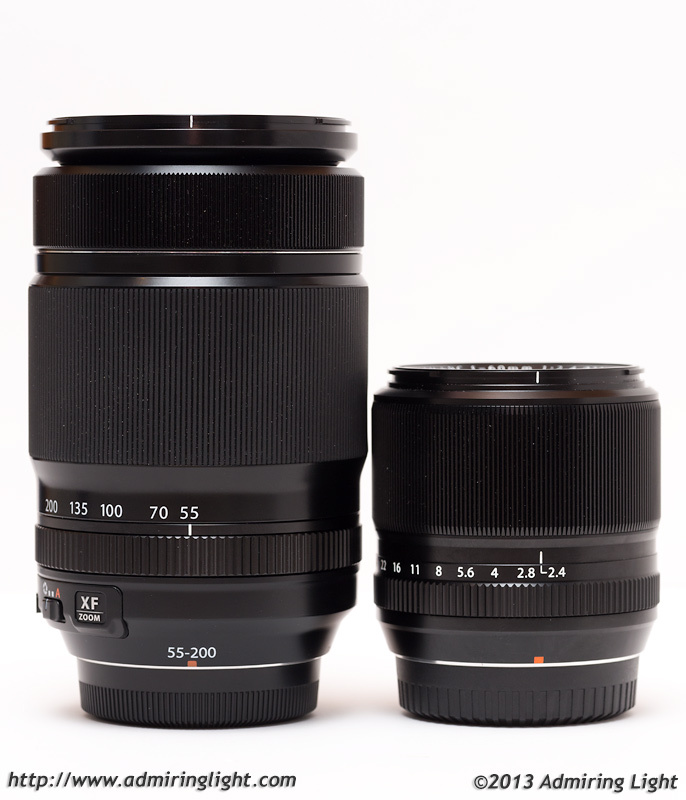 Due to its relatively large size, the Fuji 55-200mm is best used with one of the added grips available for the X-Pro 1 and X-E1. The lens is quite front heavy when used without the grip, and I much preferred the ergonomics of using the 55-200mm when I added the Fuji grip to my X-E1. The lens features two switches below the aperture ring. One controls the Optical Image Stabilizer, while the other switches the aperture function between automatic and user selectable modes. The lens features moderately quick autofocus, though it’s not going to break any records. Still, in general use it was more than adequate. The LM in the full lens name indicates that the 55-200mm uses a linear motor drive system, and this focus motor is extremely quiet. The lens features an optical stabilizer and Fuji has done a fantastic job with the IS on the 55-200mm. I found it to be one of the very best optical stabilization systems I’ve used in any lens, typically allowing for shutter speeds 3-4 stops slower than typically used hand held. I was able to consistently get sharp shots at 1/20s at 200mm. Next we’ll take a look at image quality. Jordan Steele thank you for nice review ! Thanks for your interesting article and great sample shots. It would be handy to many people, I expect, if you might add your shutter speeds to the captions; people already know the lens aperture range. I purchased the 55-200 zoom about three months ago, but I’ve been disappointed with the image quality. The sample photos that you provided are great. I’m not sure why my experience with this lens has been somewhat different. The images that I’ve shot have not been as sharp as your samples. I totally agree with Jordan. This telezoom is an excellent performer, its price is very reasonable. No matter if it is used at full aperture or stopped down, the results are top notch. Love this lens! 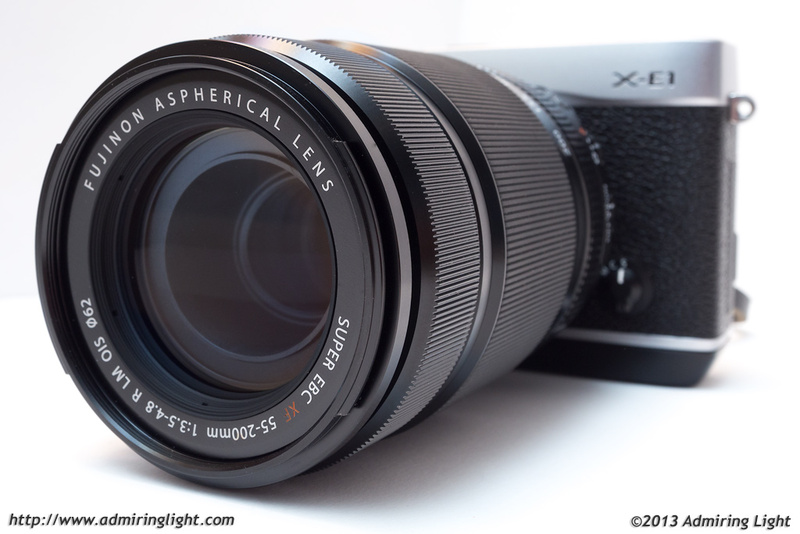 It’s a couple of years since you posted this review and lots of lenses have been added to the Fuji system since then. Would you consider adding a post-script to this review to reflect on how the lens compares to more recent Fuji telephotos like the 50-140 or the 90? Like many others I love the compact Fuji primes but often find myself missing a little telephoto reach. I want something longer than my 56 but the bulk of the 50-140 seems to defeat the point of a small mirrorless system. Is the 55-200 the answer I’m looking for or do the newer lenses outclass it? Great comparison Jordan – thanks for passing that on. The 90 certainly is tempting. One of the reasons I haven’t yet abandoned my Canon 5DmkII is the 135 f2 which is close to my favourite lens of all time. I’m personally very comfortable with the constraints that field of view imposes so the Fuji 90 may just tip me over the edge! Incidentally I’d like to say how greatly I appreciate and admire your work. The quality of the sample images you provide with your reviews is always exceptional. Thanks for all the advice – and inspiration – you share with us all. Mine is noticeably soft at 170mm and above, at any aperture. Even manually focusing it. Quite disappointing.